Depression is a widespread disorder that affects individuals of all ages, even children. Experts estimate that this condition affects up to 18 per cent of the total population at least once in their lives. To make matters worse, depression can further cause other health issues. According to the World Health Organisation, it is among the leading causes of disability worldwide. The good news is, studies have established that exercise significantly helps people of all ages when it comes to fighting depression. That is why many health experts, including your trusted Canberra chiropractor, encourage people who are experiencing depression and those who are at-risk of developing it to maintain an active lifestyle by having a regular exercise routine. Consult your health care partners, us here at the Canberra Spine Centre, especially if you have not exercised for a considerable amount of time. We can guide you in designing an exercise routine that best suits you. Choose an activity that you know you can enjoy. All forms of exercise are good at fighting off depression. That is why it is more preferable to choose from activities that you find interesting and enjoyable. Incorporate exercise and physical activity into your daily routine. Walking and taking the stairs are also great exercises. Take more and more steps per day. You can start small and just increase it gradually. 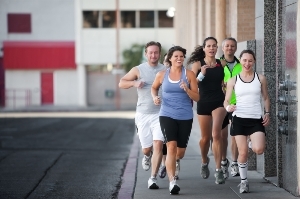 Ask a friend or family member to accompany you and become your exercise buddy. This helps both of you to be more motivated as you work on achieving better health. Plus, consistent and increased contact with other people eases depression symptoms. All in all, exercise is an effective and all-natural anti-depressant for you and your entire family. To learn more about achieving and maintaining a healthy mind and body, consult your reliable health care partners here at the Canberra Spine Centre. Your trusted Canberra chiropractor can provide you with a holistic approach to help you achieve optimal overall health and wellness. How Can Exercise Beat Depression?